St Patrick's Day on the 17th March is about celebrating all things Irish. Facebook, Twitter and Pinterest will be full of images of Leprechauns, shamrocks and every type of food will be dyed with green food colouring. Instead of celebrating the colour green for St Patrick's Day, I'm celebrating Irish quality produce and, in particular quality Irish Beef. Bord Bia, The Irish Food Board are keen to spread word about the quality of Irish Beef and sent me The Irish Beef Book by Pat Whelan and Katy McGuinness to review, along with a large joint of Irish Brisket to make one of the recipes. If you want to find out more about Irish produce or access more recipes then pop over to the Bord Bia website. 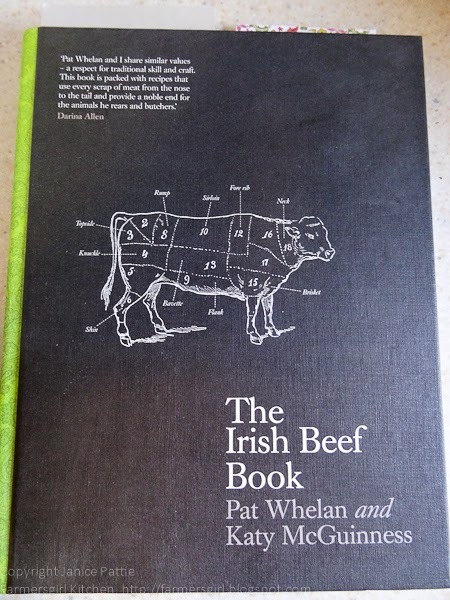 The Irish Beef Book starts with an introduction to Irish Beef: A world class natural product, covering What makes Irish Beef so good, The Whelan Family History , How to choose good quality meat. A bit about Breeds and the food culture of Ireland and Irish Artisan Food Producers. There is an excellent explanation of the different cuts of beef and how they are best cooked and also a treatise on 'The Thorny Question of Fat'. The Recipes in this book are intended for the domestic cook, there are no cheffy tricks and cooks are encouraged to use local ingredients where possible. Each chapter begins with photographs of the different cuts and cooking tips. The first chapter is all about Steaks and also includes some 'Good Things to Eat with Steak' including Triple Cooked Chips, Roast Onions in Balsamic Vinegar and a variety of traditional sauces such as Bearnaise and the less traditional like Chimichurri. Roasts are always popular and this chapter contains everything you need to know to roast beef just the way you like it. No Roast dinner is complete without the Trimmings, so recipes for Individual Yorkshire Puddings, Creamed Horseradish and Beef Dripping Roast Potatoes are all included, as well as alternatives such as Horseradish and Dijon Mustard Yoghurt Creme Fraiche. Other options for your roast include Roast Fillet with Prosciutto or Brisket and Butternut Squash Pot Roast with a Rosemary Gremolata. Chapter 3 provides us with 'The Classics' including Steak Tartare, Beef Wellington, Boeuf Bourguignon, Steak Diane, Beef Stroganoff and Beef Goulash. If you are in a hurry then Chapter 4 provides some Quick Beef recipes including Skirt Steak Fajitas, Steak Sandwich, Beef Teriyaki with Spring Onions, Pomegranate-Marinated Hanger Steak with a Warm Farro Salad, Beef and Green Vegetable Stir Fry with Oyster Sauce. Regular readers of Farmersgirl Kitchen will know how much I like slow cooked recipes, so Chapter 5: Long and Slow is full of just my kind of recipe some of the recipes which appealed to me particularly were Beef with Anchovies and Olives, Braised Beef with Five Spice, Ginger and Highbank Apple Syrup, Beef Rendang, Braised Short Ribs with Maple Syrup and Star Anise and Moroccan Tagine with Preserved Lemons. Chapter 6 brings us Burgers, Brisket, Meatballs and Dude Food! The burger recipe uses Knockmealdown porter a craft beer produced by Eight Degrees in the beautiful Ballyhoura region of County Cork. As well as the burger recipe there are recipes for 'Good Things to Eat with Burgers' and so to the brisket: I'm a huge fan of brisket as a cut of beef, for me, it has more flavour than the faster roasts and shrinks less too. 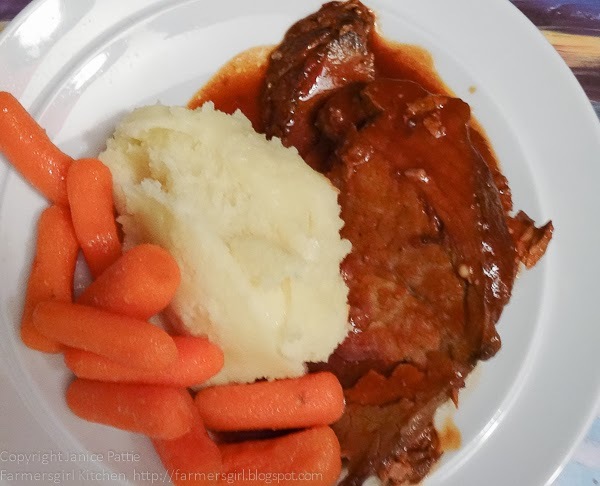 The recipe which ticked all the boxes for me was Slow Cooked Pulled Chipotle Brisket. (recipe below). Chapter 7 is a shorter chapter with recipes for Pasta and Pizza including Irish Beef Cheek Lasagne, Bone Marrow Pizza and Oxtail and Truffle Pizza. Pies are always popular and I am tempted by Braised Beef Shin and Eight Degree Ale Pie and Individual Potato-Topped Steak and Chorizo Pies. Bringing in 'the coo's tail' (cow's tail) is a chapter on 'The Other Bits'. Liver and Onions with a Mushroom Sauce is a dish Pat cooks for his family as a quick supper. I'm not sure I could face cooking a beef tongue, although my granny regularly cooked and pressed tongue, maybe that's what put me off! However, a Salad of Tongue and Roast Beetroot with a Balsamic Dressing sounds amazing. I've never tried Bone Marrow, but there are a number of recipes here which tempt me to do so. The book concludes with two pages of comprehensive Conversion Charts and an Appendix of Tipperary Food Producers. 1. Combine all the ingredients for the marinade. Slater the marinade all over the meat and place in the fridge, covered with clingfilm, overnight. 2. 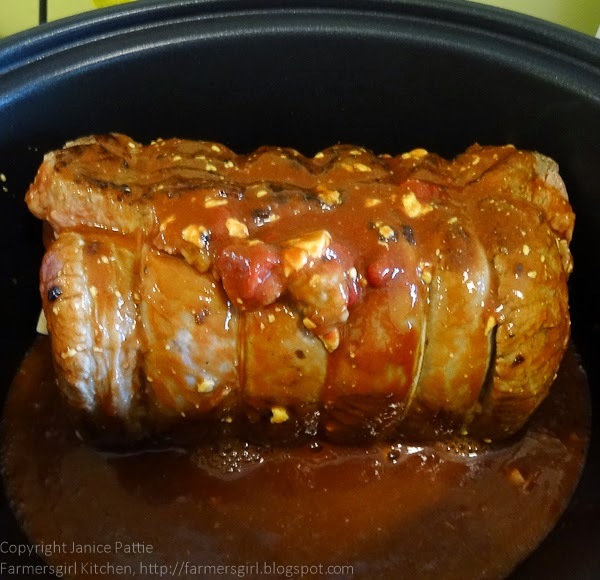 The next day, place the brisket and marinade in a roasting dish and cover well with tin foil. 3. Cook at 130C/fan 110C, gas mark 1 for about 5 hours or until the meat is very tender and falling apart. 4. Cook for a further 30 minutes without the foil, until the meat is nicely browned. 5. When the joint is cool enough to handle, remove any excess fat and shred the meat. 6. Pour the cooking liquid, along with any interesting caramelised sauce, into a jug and allow the fat to rise to the top. Skim off the fat, reduce the juices if they are very liquid, and add the pulled meat to the remaining juices. 7. Serve in a bap with red slaw. 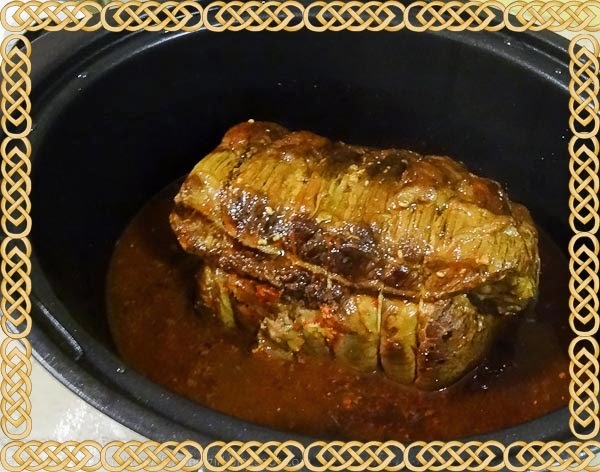 As I am currently without an oven, due to building work, I put the brisket and marinade in the slow cooker and cooked on low for 10 hours until the meat was very tender. I sliced it and served with mashed potato and carrots. The cooking liquid made a superbly piquant sauce. I sliced and froze some of the beef for another day, however there was still lots left over so I made it into a lovely curry. I sauteed a small sliced onion, added a tablespoon of curry paste, two chopped tomatoes, a couple of slices of brisket chopped up into bite-sized pieces and add the brisket sauce, bring to a simmer and add a handful of frozen peas. Cook for 5-10 minutes and serve with rice. 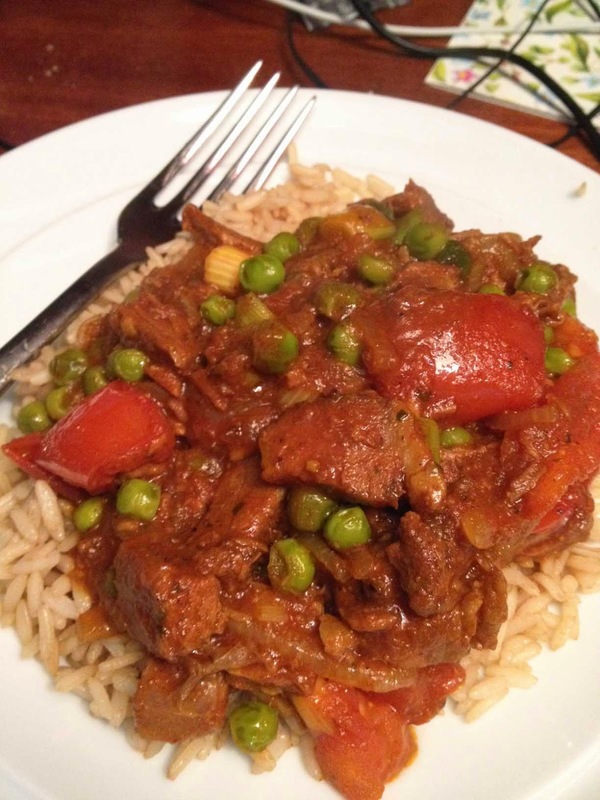 St Patrick's Day Curry with GREEN peas! Okay, so I couldn't resist a wee bit of St Patrick's fun, courtesy of Kate Hadfield's 'Luck of the Irish' digital Scrapbook Kit. 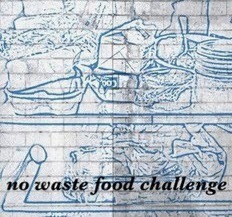 I'm entering the curry for the No Waste Food Challenge, run by Elizabeth's Kitchen Diary and hosted this month by Chris at Cooking Around the World. I was provided with The Irish Beef Book and a joint of beef by Bord Bia, The Irish Food Board. I was not paid and all opinions are my own. Thanks Dom, I think you and I could happily eat each other's dinners any time! That is one good looking piece of meat!! This is making my tummy rumble like I can't tell you - especially knowing it's cooked in the slow cooker! The marinade sounds fantastic and it all looks so tasty. It makes me want to go out and buy a brisket! That looks amazing, my husband would adore this. I like your Pinterest-friendly St Patrick's Day artwork! What a LOVELY book and a fabulous piece of beef too, and in one of my favourite marinades, aka anything with chipotle chillies in it! I DO love brisket, it has to be my favourite cut of beef. Wow two recipes in one! I do enjoy chipotle and I bet the beef tasted lovely after 5+ hours of slow roasting. I love slow cooked anything and I am obsessed with chipotle, so this is definitely one for me to try. Just had some more slices of this tonight, Chris? Too good for curry, it froze beautifully. The marinade makes a lovely sauce. That looks & sounds to die for Janice, 'fall apart tender' is just how I like my meat cooked. Yum! I love that you added a leftovers recipe too, there's only two of us but I always make much more than needed and freeze it for quick week night meals. Two recipes for the price one, great stuff! I couldn't agree mire with the comment above, a leftover recipe is super useful...although I can't imagine there is much leftover here Janice?! Love brisket, such a lovely cut for long slow tender fall-apart cooking. Sounds like a very tasty marinade too, bet it was divine! It sounds lovely. I usually turn to pulled pork and might adapt my recipe for a brisket! Thanks Sarah. It takes a bit more time, but hoping it will attract attention. My favourite cut of beef too, Karen and I love those chipotles, put them in everything instead of ordinary chillies now. lovely idea. we do slow cooked meats to pull like this. We have tried similar cuts of meet and roasted for even longer cooking times which works well but clearly yours turned out beautifully and looks delicious. Love the idea with your ideas for leftovers too!